I love this pattern, and I wish my camera would capture the colors better. There are 2 big WIPs in my craft basket, and they've been there for 2 weeks and many months. The one above is the more recent of the two. 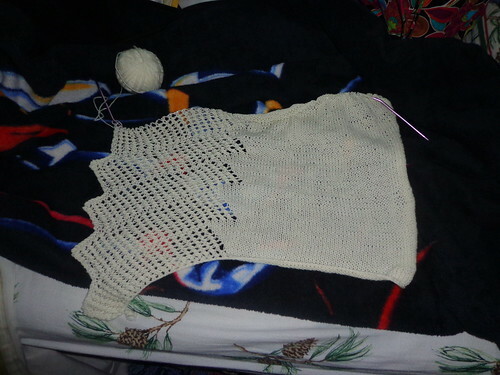 Below is a creamy knitted poncho. Both are using KnitPicks yarns. One is for me, one is a commissioned item. 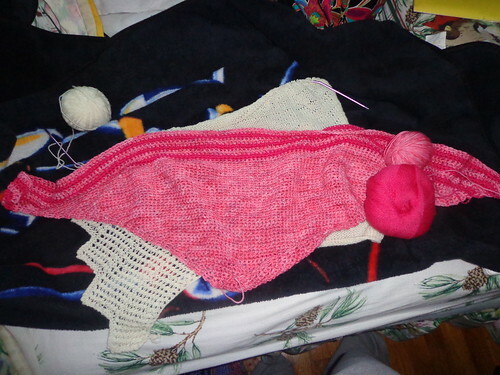 I really need to get on task and work on the knitted poncho. Friday night, it was the only project I worked on. I love the mindlessness of the knitting, now that I've figured the pattern out. I mentioned this in my Friday post, and a visual will probably help-- as you can see, it is knitted in sections (well, the lace part is) and each lace wedge has 7 yarn-over "ladders", I guess you could call them. So instead of keeping a tally, I now am able to just count the ladders to check my progress. It's a pattern that the friend who commissioned it picked up at a LYS "up north" as we say in Michigan, and I don't think the pattern is written well. Not trying to insult the designer, just saying it could be easier to understand if written better. If nothing else, I like working on the knit better than my Steph, as the rows are over 100 stitches and take pretty much forever. I'm not even on the short rows yet! You can see a bit of the size difference here. Even though I'm in the midst of KCBW, I wanted to share what I've been working on. And its not too late to get in on the fun! love both the projects! The pick is a beautiful shade! Lovely projects, specially the pink one! Both pretty projects. 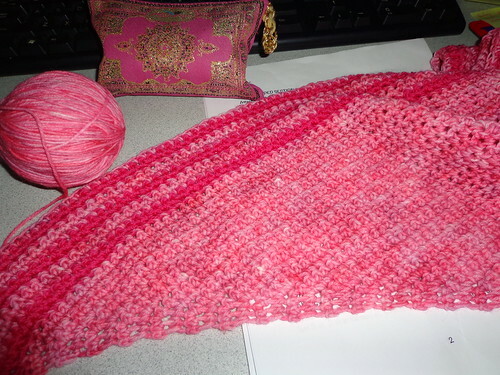 Love the pinks in the shawl, long rows can be a drag. I love the Steph! The pink colours are gorgeous together. The coral color is lovely.